To deliver the full profile of Nature’s bounty to you, each nutrient in CoQ10+ Food Complex is cultured in live probiotics. Those are the healthy bacteria found naturally in fermented foods such as yogurt, tempeh, kefir, and sauerkraut. By culturing vitamins and minerals in a probiotic matrix of fermented organic soy, fruits, and vegetables, we create whole-food complexes that the body can easily recognize and digest because they’re food. Delivers essential nutrients in a safe and active form within the infinite complexity of food. Whole-food complexed CoQ10 combats oxidative stress and supports multiple facets of cardiovascular health. 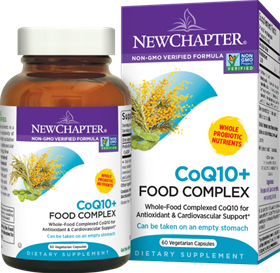 Backed by human and in vitro testing, New Chapter’s dual-cultured CoQ10+ demonstrated superior antioxidant activity over the chemical isolate form of CoQ10. Probiotic-cultured nutrients provide a broad spectrum of phytonutrients and ferment metabolites, including isoflavones and beta-glucans. Once-daily formula is easy to take, easy to digest, and can be taken anytime—even on an empty stomach! New Chapter supplements are whole food, easily recognized and absorbed. New Chapter vitamin, mineral and herbal supplements are a whole-food complex – something your body easily recognizes and absorbs. Sourced from nature’s bounty of organic fruits, vegetables, herbs and superfoods and cultured in probiotics to deliver the full spectrum of Nature’s benefits. Gentle on your stomach because they’re food. Because New Chapter’s vitamins, minerals and herbs are a whole-food complex, they’re gentle on your stomach. So gentle that you can even take them on an empty stomach. In fact, they don’t even consider them food supplements, They’re supplemental food. New Chapter was the first company in the world to produce a full line of whole food complexed vitamins and supplements certified to be made with organic ingredients. They believe the natural purity of organic ingredients is better for people and better for the environment. Many of their vitamin, mineral and herbal supplements are certified organic and most New Chapter products are made with organic ingredients. From the fruits, vegetables, herbs and superfoods we source around the world to their very own biodynamic farm in Costa Rica. Other ingredients: Culture media (organic milled soy [including isoflavones], organic Saccharomyces cerevisiae [active and inactive, including beta-glucans], organic maltodextrin, organic gum acacia, lactic acid bacteria [L. acidophilus, B. bifidum, L. rhamnosus], papain [deactivated] and bromelain [deactivated]), organic milled rice, hypromellose (capsule) and silicon dioxide.